Whilst on the First World War Centenary Battlefield Tour Programme we learnt both about the scale of devastation and the personal stories within it that can often be overlooked. By researching individuals such as Cyril Manners and John Henry Fletcher, both of which served for the Wiltshire Regiment in the Great War and lived in Corsham and Neston, we were able to gain a personal insight into the impact of their deaths on family and friends. 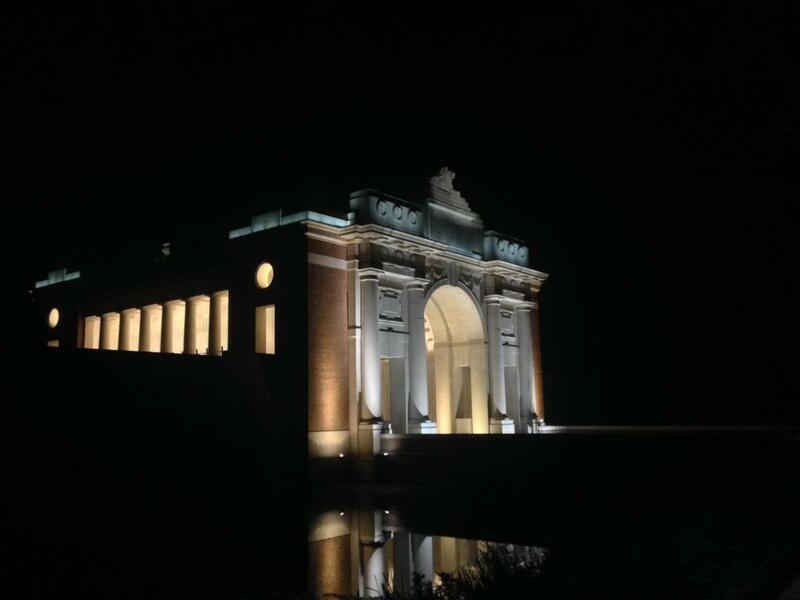 During the programme, we visited cemeteries including Tyne Cot, Langemark and Thiepval, as well as attending the ‘Last Post’ ceremony at Menin Gate in Ypres, where each day since 1928 an act of remembrance commemorates a different fallen solider. As an additional act of remembrance, we also participated in the ‘Coming World Remember Me’ pottery project that aims to create an art instillation in 2018 of 600,000 clay soldiers to commemorate those that died on Belgian soil during World War 1. Such memorials and ceremonies illustrate that to this day, it is of equal importance to remember the lives lost and lessons learnt in order to prevent future tragedies. Since returning from the Centenary Battlefield Programme, we have endeavoured to inform our peers and families of the importance of commemorating those who died. To express how this opportunity has profoundly affected our outlook on the Great War and everyday life, we intend to compile our video footage of the experience into a short remembrance clip to reach a wider audience in light of the ‘Legacy 110’ scheme. 31 Corsham students in Years 8, 9 and 10 went for one week to our partner school in France, Collège Samuel Dumenieu, Montendre. Each student was paired with a French student, and stayed with them and their family for the week. During the day, we went to school and took part in a variety of lessons, including crèpe-making and cheese-tasting. 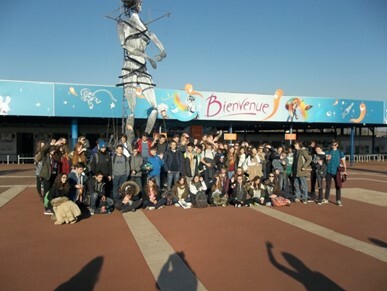 On other days, we had trips out to places such as the Futuroscope theme park and to the nearby town of Bordeaux. We all had a really great time, and everyone got on really well with their partners and the families. 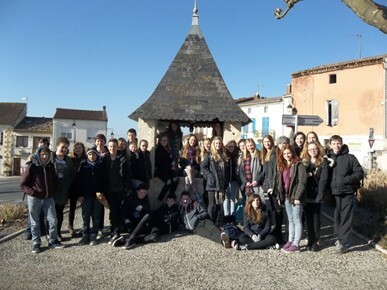 We are now looking forward to our French partners’ return visit in April. 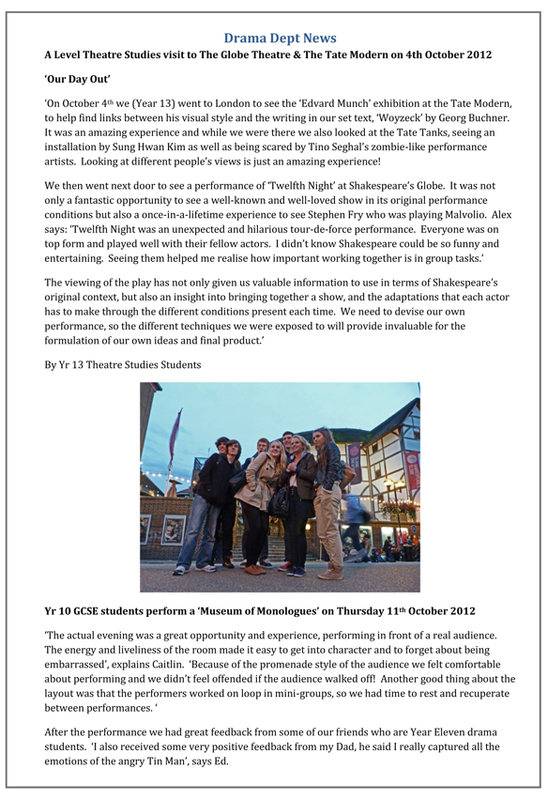 Y13 had an amazing opportunity to have a tour of the Globe Theatre on Thursday 24th October 2013. As well as being able to see a traditional style Jacobean theatre we were lucky enough to learn about Shakespeare and traditional acting methods from his era. This will be helpful to us as we cannot only incorporate these techniques into our Devised Piece (Unit 3) but also with our written exam. Later on we visited the Tate Modern where we engaged in an exhibition on ‘Word Sound Power’, by the Khoj International Artists’ Association. An installation which increased our spoken ability in performance was a particularly interesting way to explore speech and sound. Finally, down the river at the Lyttelton Theatre, we had a fantastic chance to watch Julie Walters in discussion with Sir Richard Eyre and Literary Manager Christopher Campbell. It was wonderful being in the same room as these inspirational people and it also gave us real insight into the National Theatre in its 50th year. Each section of the trip was a progression of theatre through time, allowing us to compare the historical with the modern. To enhance their wider personal development, we encourage all Year 8 students to join the Oxenwood Challenge in the latter part of the Autumn Term. Although it is not a compulsory school trip, we do subsidise the cost and make every effort to encourage everyone to take part. It is planned as a development of the fantastic ‘Challenge Days’ which were held for Year 7 at the start of this year. Oxenwood is a special place. A tiny village set in the depths of the Wiltshire countryside in the shadow of the ancient Iron Age hill fort at Fosbury where our students can feel they are truly away from the usual routines of home and school. Here they take on a series of challenges with their tutor and fellow students to find out more about themselves and each other. The Oxenwood Outdoor Education Centre is based in the old village school, although it has been developed considerably over the years to provide a cosy and flexible learning space with provision for a host of challenging activities. Our aim is to help each student develop their personal strengths under our school themes of ‘citizenship’, ‘teamship’ and ‘audienceship’ along with a chance to show independence and creativity in all that they do. Here is one teacher’s perspective of what we did this year – reports and reflections from our students will follow next term – watch this space! Our first task on arrival is a map-reading challenge where groups have to decipher a code and then get themselves up to Fosbury hill fort by one of four routes. Students are on their own, expected to get there with no adult help and their ‘teamship’ and ‘audienceship’ skills are immediately evident as they throw around ideas, take the lead , listen and negotiate with each other and (some more successfully than others) arrive at their goal. At the top of the hill (whatever the weather), they are set further challenges: making stretchers, putting up tents and even lighting a fire – teams working together again. Back at the Centre, there is time to spend on ideas for the final presentation where students have to come up with an idea to research, prepare and present to the group on the last day. Some are already thinking of something to do with Anglo-Saxon life, others have spotted a red kite soaring in the wind and want to find out more – others are ready for further inspiration as they look forward to the rest of the trip. After a hearty meal, it is time to prepare for the infamous night walk. This is an Oxenwood tradition which includes the challenge of ‘spooky alley’. On some nights we are lucky as a cloudless sky and little light pollution enables the group to see a spectacular starry sky – our leader points out Orion’s belt, The Plough and the tell-tale streaks of the Milky Way, although one girl, it turns out, is a bit of an expert herself and adds further fascinating facts to the amazement of her friends. ‘She is usually so quiet…’ someone remarks! The independence skills at bedtime speak for themselves, some students explaining that they have never slept a night away from home. ‘Citizenship’ is seen in abundance as duty groups help to run things – including ‘washing-up’ which for some seems a dark and mysterious art that they have never before experienced. On the second day we are set three challenging activities, with students mountain-biking in the morning and canoeing in the afternoon swapping over at lunchtime to make sure everyone tries everything. The last activity is the climbing wall, tackled in the dark under floodlights with one group even attempting it in the driving rain – it felt like climbing Everest. The mountain biking is a revelation as one of the centre leaders explains the proper way to ride a bike ( particularly in these wintry conditions) and then we’re off through the mud and puddles, rocketing down muddy paths, dodging tree branches ( and each other). Will we meet the challenge of the ‘big hill’, gasping for breath as we rattle down the gears for more traction? Some of the group fall back, almost in tears, but others encourage them and support – whoever they are. We all get completely soaked and muddy ….and we love it! At the Kennet and Avon Canal, the muddy bank is the launching spot of three man American canoes. After the safety talk, the boats wobble out mid-stream and the teams sort themselves into a working system. This is where teamship finds true realisation – this canoe just won’t go in the right direction unless we are all paddling the same way and cooperating with each other – what a great message to take back to school! At the climbing wall later, the shouts of encouragement ring through the chilly night air as personal fears are overcome and, even in driving rain, the wall is conquered. That evening, a karaoke session with even the shyest of the group drawn in to perform in front of everyone, their inhibitions truly dropping away now as they feel comfortable to look silly in this supportive atmosphere. Even the teachers are persuaded to sing – to the great amusement of all. The last day is a mixture of shelter building up in the woods (with groups showing tremendous inventiveness and creativity) and a session finishing off and ‘performing’ our presentations. These show an amazing range of subjects from history to nature, geology to poetry and are really appreciated by everyone as they show great audienceship skills. After three exhausting days, we have all been through something rather special together – hard to sum up in a few sentences. Staying away from home (a ‘ressy’ one of the leaders calls it) really throws us all on our own resources and it is simply inspiring to see students show so many different aspects of their characters which are not seen at school.It is often the loud and confident ones that find it hard out in the wilds and the quiet ones who come to the fore to show us remarkable abilities and knowledge. We will be posting further pictures, comments and reports over the coming weeks and are already looking forward to repeating this experience with Year 8 next year. The Corsham School was approached by ITN for permission to film and interview year 9 students in their History lesson and on their field trip to Ypres in Belgium. 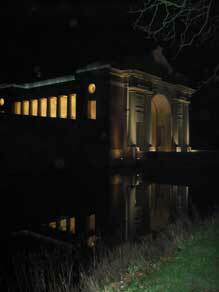 We met up with the ITN reporter and film crew at Tyne Cot cemetery in Ypres and again later that evening at the Menin Gate. The film and interviews were to accompany both the local and national news coverage of the Prime Minister’s announcement to direct funding towards trips to the WW1 battlefields. The students involved in the lesson and the trip were a real credit to the school, in fact the quality of their responses was so good, that ITN cut the Prime Minister’s announcement down to make more room for out students voices! 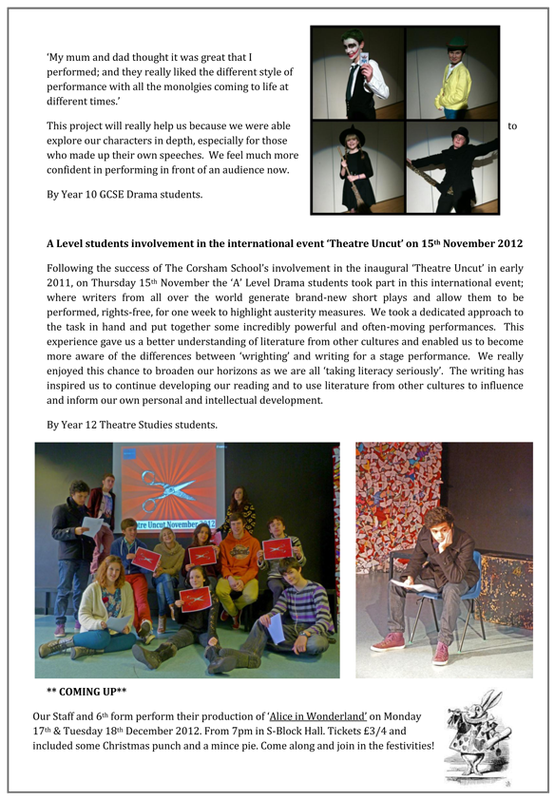 Well done year 9, you have yet again done the school proud. A calendar of school trips for 2012/2013 has now been published on the specific Year Group websites. 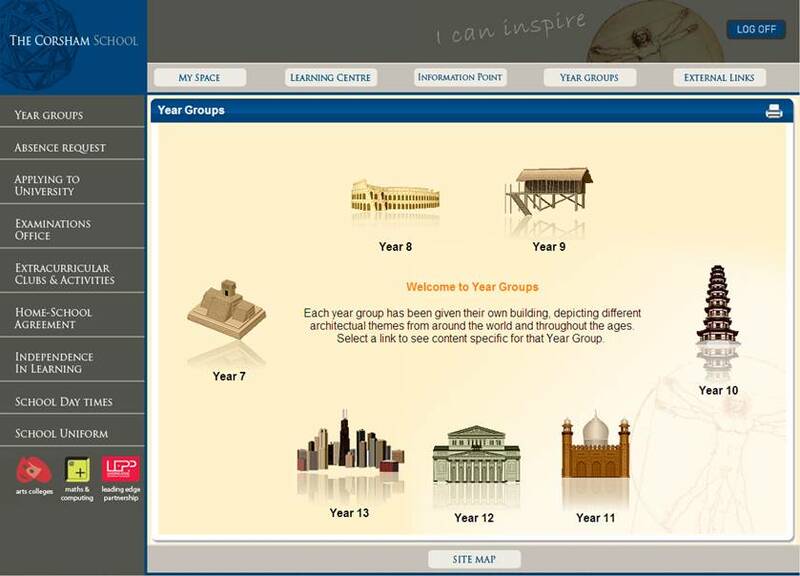 These can be found by logging on to The Parent Portal and selecting the Year Groups section, then select the appropriate year group and you will be taken to the relevant information. Please email me if you need your Parent Portal login details. New Year 7 Parents/Carers will receive their accounts automatically around the end of September. After a very early 5.30 am departure, both groups had speedy journeys to Belgium through the Channel Tunnel, with driver Mike. First stop: the trenches! 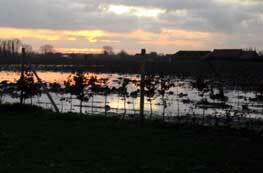 And our wellies were needed after the recent rain. We all appreciated how cold and wet conditions would have been, with men in position on the front lines for days at a time. 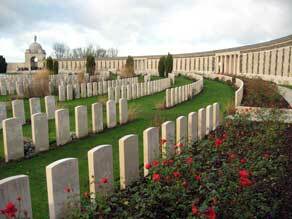 Following a well earned hot meal at the hostel, we departed for the Last Post ceremony at the Menin Gate. Holly Rush and Rob Flather laid our wreath on behalf of CORS, and Chloe Wright and Harvey Plant on behalf of HAMW. Our living wreaths, as always, looked absolutely beautiful and were provided by Theodora’s Florist in Corsham. Additionally, on the first of the two visits, Mr Holgate was chosen to give the reading, which he said was “nerve-racking but very memorable”. Back at the hostel, we all ‘relaxed’ at the end of a long day with our ‘Belgian Bar Quiz’ during which competition was fierce! Our beds were very welcome at the end of such a busy day. After a busy morning in Ypres on Day 2, visiting a number of sites including the interactive ‘In Flander’s Fields’ museum and the Belgian chocolate shop, we departed for Calais via ‘City Europe’, where students practised their linguistics with some retail therapy, before being whisked back to ‘Blighty’. 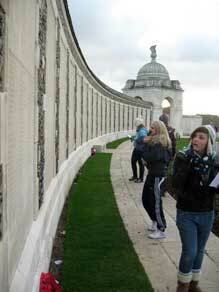 The students were impeccably behaved whilst touring all of the sites, and particularly whilst visiting the cemeteries. Thank you to all the students and staff who participated this year, and made each visit so special! If any participants have any photos of the visits, please email them to Mr Parsons at ele-manager@corsham.wilts.sch.uk, for the School Website – chocolates for the best photo! A group of 11 students from Year 9 completed their expedition to Morocco at the end of the Summer term. This was the culmination of 18 months of preparation and fund raising. Many were able to raise all the funds for the trip with all sorts of different ventures. There was bag packing, car washing, dog walking, newspaper rounds, sponsored walks as well as a sponsored cycle ride from Lands End to Corsham. The students met regularly in school to prepare for the expedition and were accompanied by Miss Daltrey and Mr McLeod. When the team reached Marrakech they had a day to acclimatise to the high temperatures and the very different culture. They then headed to the Atlas mountains and stayed in a mountain village called Armend where they spent some time with the local community. From there they headed to the spectacular Cascades d’Ouzoud and then on to the mountain region called the M’Goun Massif. After meeting their mules and muleteers, they set off on a challenging 4 day trek through the mountains and lush valleys of the M’Goun. Conditions were very challenging with temperatures on some days in the high 40’s (Celsius!) The team were either camping or they stayed in friendly but basic Berber hostels, meeting the locals whose lives are largely unchanged since medieval times. Then the team headed south to Zagora and on into the Sahara Desert on camels for an evening in a Berber tent under the stars. From there it was a long journey back to Marrakech. The last day was spent exploring the labyrinth of different souks for some last minute haggling and in the evening it was Djemaa El Fna Square with its dramatic mix of musicians, healers, storytellers dancers & snake charmers.